Spring is in the air…at least in California! 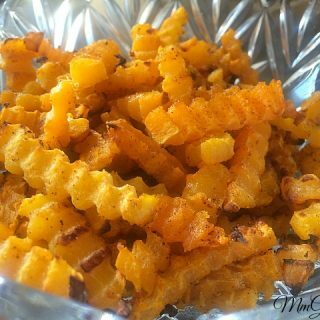 What that means for me is healthier options in eating so you will be finding more fish recipes, healthier choices in snacks and of course amazing side dishes (you all know I love my sides). 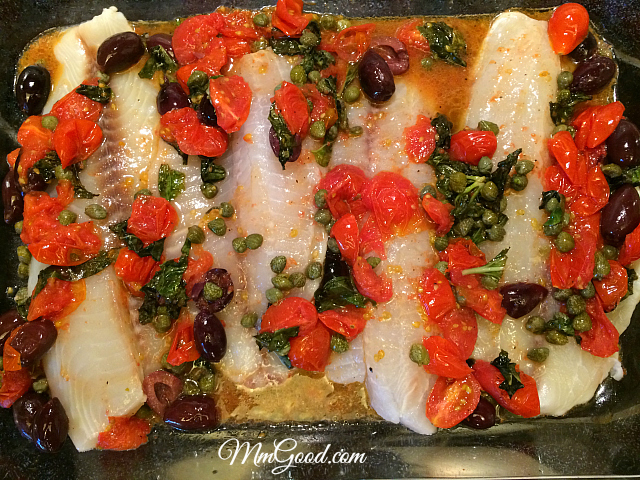 For this recipe, I used tilapia but really any white fish would work just fine. In shopping for the fish, look at the pieces, be picky…pick the pieces of fish that are more uniform in size, as it will allow the fish to cook evenly. 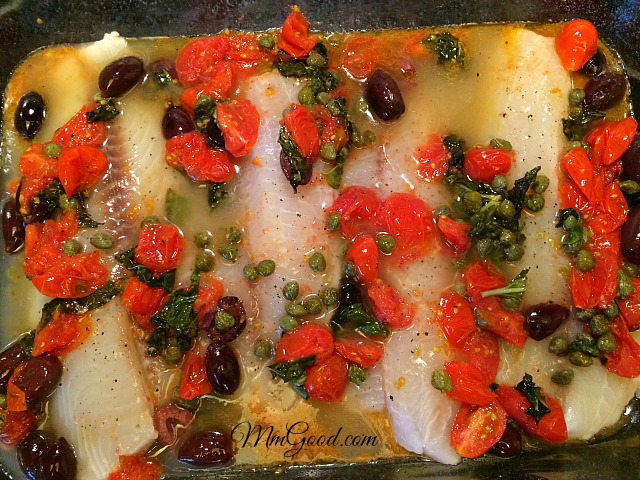 I wanted to add a little Mediterranean flare to my tilapia dish so I used capers (that are rinsed), tomatoes, basil and pitted kalamata olives. This combination of ingredients is very common for Mediterranean food, I also added fresh lemon juice. 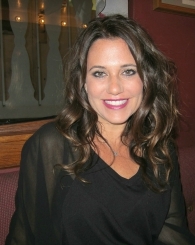 In less than 30 minutes I had the most amazing dish…and so will you! 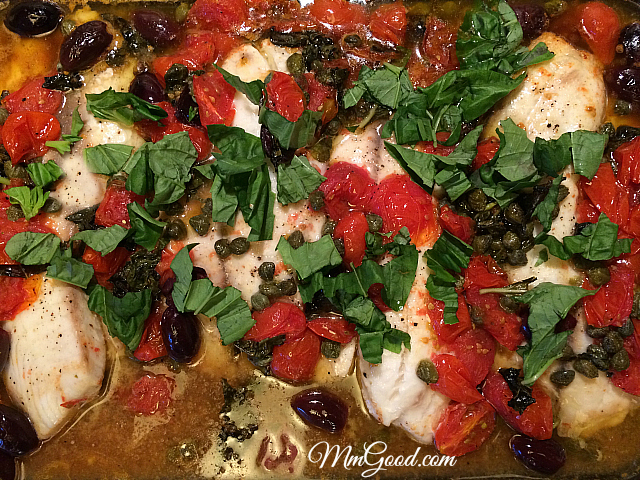 I absolutely loved this recipe, it’s healthy with so much flavor! Here is the best part, while I am not a fan of eating leftover fish, this fish dish tasted amazing straight from the refrigerator, I didn’t even have to warm it up. This recipe can be doubled or tripled if you are having a large group for dinner and I can assure you they will all LOVE it!!!! 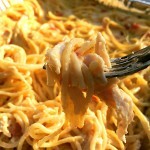 Thank you for visiting my site and I hope you enjoy this recipe. I do love comments so please feel free to leave me your comment or suggestion. 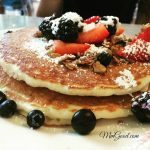 If you would like to be kept up to date with all my new recipes, I only post twice a week, please subscribe in the box listed on the top of the page “Subscribe Via Email”. You will be emailed with a link to confirm you are interested in the subscription so be sure to click on that link too. 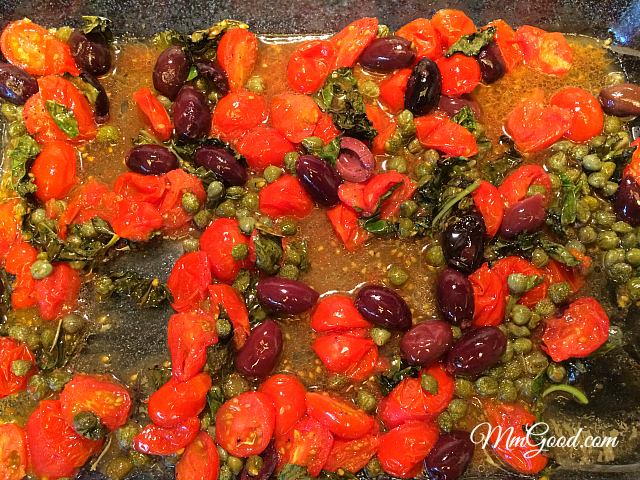 In a 8x13 pan put 1 tablespoon oil, cut tomatoes, rinsed capers, basil (reserve some for presentation) and olives. Bake for 13-15 minutes. 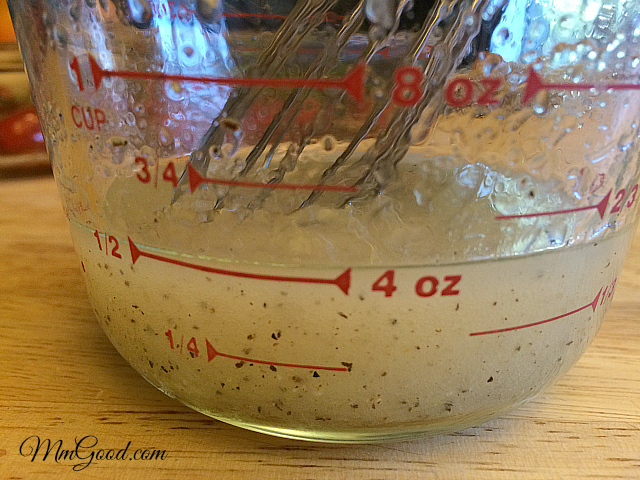 Meanwhile prepare a "dressing" of lemon juice, 2 tablespoons of oil, salt and pepper and set aside. 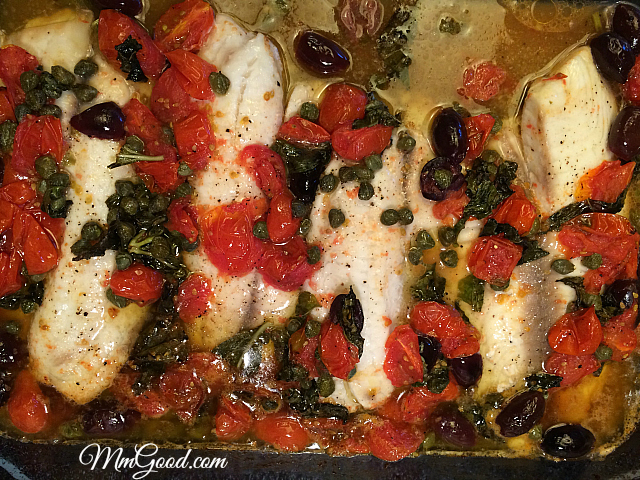 Remove the pan of roasted tomatoes and ingredients from oven, reduce the oven to 375 degrees. Using a spatula, move the roasted ingredients to the side so you can lay the fish directly on the pan, top the fish with the roasted ingredients. Pour the "dressing" of lemon juice and oil on top and bake for an additional 10-12 minutes or until your fish is cooked through. 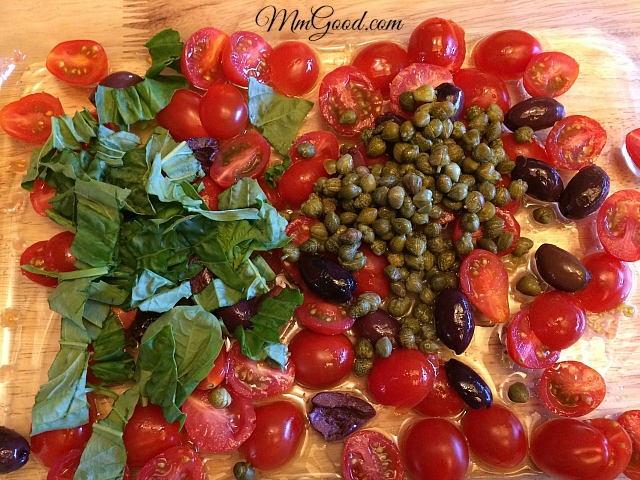 Remove from oven and top with the reserved fresh basil. Enjoy!